Spherification is by far my favorite technique to play around with when it comes to new age culinary techniques. The possibilities are endless...considering the various types of spheres that can be made and the multitude of ingredients that can be incorporated into a sphere. For more on variations and spherification technique check out my Prezi on the right hand column of the blog. The sphere and more specifically the spherification technique is what made me fall head over heels for what at the time I knew as "Molecular Gastronomy". I remember being a freshman in college at Johnson & Wales University and thumbing through the internet in search of new recipe ideas, when I stumbled upon now famous chef Ferran Adria and his whimsical and daring, yet thought provoking food. I remember telling everyone I knew about this new style of cuisine and remember getting the same response every time..... that is craziness and why are people using these chemicals and ridiculous scientific machines in the kitchen. 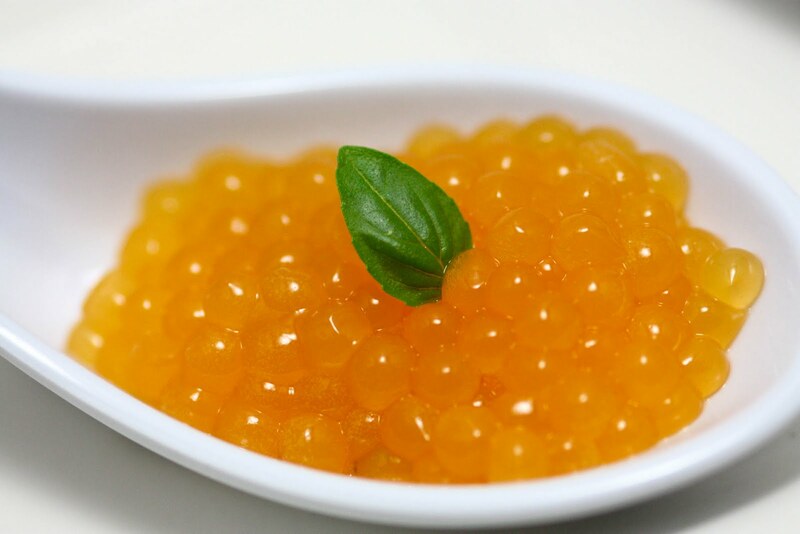 They would say that "molecular gastronomy" was ruining the simplicity and passion behind cooking. I beg to differ and always have! In fact I believe that Heston Blumenthal said it best " There are people who determinedly resist the use in the kitchen of things like liquid nitrogen and evaporators, seeing them as somehow inappropriate and "not cooking". Yet many of the technologies and tools we rely on every day in the kitchen - our fridges, freezers, and food processors, and even our non-stick pans and super-sharp carbon steel knives-are products of equally complex science. Where do you draw the line? The logical end result of this kind of purist thinking would have us all cooking with sharpened sticks over an open fire." In order to understand cooking we need to understand the science involved in cooking. Once a chef can harness the understanding of food chemistry and physics the possibilities open up ten fold. Trend setters such as Ferran Adria of El bulli and Heston Blumenthal of the Fat Duck, incorporated the food science aspect brought forth by scientists (Nicholas Kurti, Herve This, and Harold McGee). It would take another 20 years or so for the public to truly accept this style of cuisine and begin to incorporate it into their own lives. About 5 years prior to the Modernist movement I tried to make my first spheres. I purchased what I could from whatever websites or purveyors were selling at the time. This included medical grade syringes and tubing, industrial size bags of hydrocolloids, and gram scales. Since this cuisine had yet to take root all of the equipment and ingredients were very hard to acquire for home use, not to mention they cost me an arm and a leg. Once I got all of my supplies I decided to try making my fist sphere, which was pomegranate caviar. My first attempt was abysmal at best resulting in spheres that dissipated upon contact with their calcium chloride setting bath. My second attempt was not much better since I did not understand at the time that the sodium alginate needed to be sheered into the pomegranate juice in order to properly hydrate the hydrocolloid and disperse it effectively. Needless to say the liquid gelled up inside my syringe and came out as a rather chunky mess. After these two catastrophes I became discouraged and left my idea to stew for a while. My third attempt came a few years later, this time I was armed with more knowledge, so I took all of my previous mistakes into account and everything worked out good so far, until disaster...as soon as the sphere formed in the setting bath they burst and dissipated away. I was baffled by this and at my breaking point and about to call the pomegranate caviar quits. Upon thinking about the science of what was occurring it hit me! The pomegranate juice is very acidic and needs a buffer in order to allow the sphere to form effectively. Now I thought for sure I would get the spheres to works, so I added a scaled percentage of baking soda into the pomegranate juice to make the pH more neutral. This time my spheres worked perfectly. I rinsed them off in fresh water and took a sample to try. My mouth filled with a vile combination of salt and baking soda, both coming from the additives to the juice. I did not want to quit, so I tried a new hydrocolloid, calcium lactate. I also utilized the reverse spherification method and eliminated the foul tasting baking soda. The spheres burst open like mini water balloons filled with fresh pomegranate juice, success never tasted so sweet. This time I produced what I was looking for, but sometimes in cooking and in science it takes many trials and error before one can nail down what they are looking for as an end product. Looking back at my first experience with spherification I learned that research pays off and that sometimes it may be beneficial to start off walking with a more basic idea rather than running into a complex one. Now a days you can buy all the ingredients and equipment with easy to follow step by step instructional videos on website such as Molecule-r.com. These kits allow users to become more comfortable with the technique and take all the guess work out of the equation.